Here’s a hot chocolate with more variations than you may ever use. After the kiddo went to bed Saturday night, we took the opportunity to sample a few liquors in our hot cocoas while we chatted. This isn’t a super rich cocoa. It’s light and nice on it’s own, but really shines sharing the stage with other flavors. I like to serve hot cocoa in six ounce servings, but if you want bigger portion sizes by all means go for it. The Chambord won hands down for the best flavor. Although I must say, the rest were quite excellent. 1. Stir together sugar, cocoa, and salt in medium saucepan; stir in water. Cook over medium heat, stirring constantly, until mixture comes to a boil. Boil 2 minutes, stirring constantly. Add milk; heat to serving temperature, stirring constantly. Do not boil. 2. Remove from heat; add vanilla. Beat with rotary beater or whisk until foamy (I often skip this part to save time). Serve topped with marshmallows or sweetened whipped cream, if desired. Makes about 6 (3/4 cup) servings, or 5 (1 cup) servings. Add 1 Tablespoon Chambord to a ¾ cup serving of hot cocoa. Add 1 to 1 ½ Tablespoons Peppermint Schnapps to a ¾ cup serving of hot cocoa. Add 2 Tablespoons Kahlua Especial to a ¾ cup serving of hot cocoa. Add a pinch of cayenne pepper to taste per serving. Top with whipped cream. Spiced Cocoa Add 1/8 teaspoon ground cinnamon and 1/8 teaspoons ground nutmeg with vanilla extract. Serve with cinnamon stick, if desired. Mint Cocoa Add ½ teaspoon mint extract or 3 Tablespoons crushed hard peppermint candy or 2 to 3 tablespoons white crème de menthe with the vanilla extract. Serve with peppermint candy stick, if desired. Citrus Cocoa Add ½ teaspoon orange extract or 2 to 3 Tablespoons orange liqueur with vanilla extract. Swiss Mocha Add 2 to 2 ½ teaspoons powdered instant coffee with vanilla extract. Canadian Cocoa Add ½ teaspoons maple extract with vanilla extract. 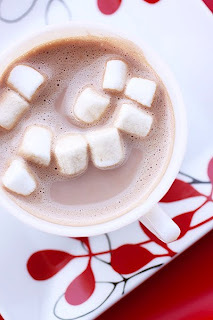 Cocoa Au Lait Omit marshmallows or sweetened whipped cream. Spoon 2 Tablespoons softened vanilla ice cream on top of each cup of cocoa at serving time. Quick Microwave Cocoa for One To make one serving, in a microwave-safe cup of mug, combine 1 heaping teaspoon Hershey’s Cocoa, 2 heaping teaspoons sugar and dash of salt. Add 2 teaspoons cold milk; stir until smooth. Fill cup with milk. Microwave at high (100%) 1 to 1 ½ minutes or until hot. Stir to blend. Hershey’s Hot Cocoa recipe from "Hershey’s Recipe Collection", Copyright 2009, Page 472. Pictures by Laura Flowers. 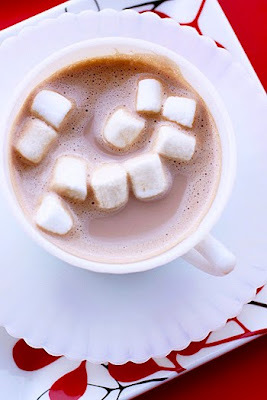 What wonderful ideas for grown up hot chocolate! I can't wait to try a few - very creative! Maybe I need one more chilly night here in Tampa! Will be trying this recipe for sure, I don't think I can mess this up! thanks for another lovely recipe! Oh with the chambord, I bet its heavenly! I love the peppermint shnaps idea. Yuuuummmm!!! I love all of the different variations! FUN! This is the type of thing we all need right now and I love the fact that most of us have all of these ingredients already. You just do not know...I just got home from teaching and I am reaching out for this going...umn umn umn gi'me gi'me now! Also, without writing a book here, you can cook it like I did before I left my son's and package it up in portions for their meals. Taste the sauce, that you know tells you so much! Mmm..cocoa. I could definitely take the Kahlua one. Very cool Laura, it's so you to not just stop at one or two flavours - go 11! I could use a cup of Cocoa Au Lait right about now - Brrr!! Sweetie! We keep finding each other through the madhouse that we call life and I love your blog so every time I find myself back here I kick myself that I don't find the time more often like I used to! New Year's Resolution: visit Laura more often! And when was the last time I had homemade hot chocolate - with mini marshmallows to boot? Years! I need some! Yum! And with a shot of Chambord? Wow! Hershey's cocoa is my favorite. I like making mine minty, but for my kiddos, they love it with whipped cream and a sprinkling of colored sugars on top. : ) Over Christmas, they call it Christmas hot chocolate because it has red and green sugars on top. Swiss Mocha and cocoa Au Lait are my favs...Will try your version soon :-) Thanks !! Chocolate and liquor? Sign me up! Peppermint Schnapps in hot chocolate? Excited to be on your team in NYC! Why didn't I think of putting Chambord in my hot chocolate? You're brilliant!!!!!!!!!!! DH's family ALWAYS drank peppermint schnapps in their hot chocolate. I had no idea what I was missing until I married Peef. Crazy. And so very simple. Love the seemingly endless possibilities here. Chambord sounds like a really nice one to try! Oops! I left out the cocoa. I've had a cup of hot cocoa a few times already this week, but I love all of your variations. Great ideas--the mint cocoa is my favorite. Your photo looks just like my after dinner treat last night! I want one of each now! Love the pics! I have never tried it Cafe Au Lait style. I will love it! My favorite is one you have not posted though, which is hot chocolate with rum, particularly Sailor Jerry's rum. Soo delicious on a cold night. looks scrumpious! your photos are excellent. I love hot chocolate with a shot of espresso and a healthy hit of cayenne pepper..
Chamborg and hot chocolate??? Oh my! I have all these ingredients in my hse and Im making this tonight!!!!!!!!!!!!!!!!!!! Beautiful picture! What a list of great cocoa's to use on a cold night, thanks for the ideas. And, I love your new site! great great great suggestions! yum! I love hot chocolate. Mmmmm...what fun you must have had testing and tasting. I've never added liquor to hot cocoa...and am wondering why not! Thanks for the recommendations, Laura.